Blogging by smart phone en route to the worksites has a few limitations. 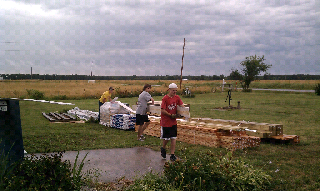 My group, the awesome group 2, is working in Diamond, MO. We are working on Jackie's mom's house (JMH moving forward). Jackie shared her story with us and I'll write more later. When we arrived the sky was ominously dark and rain was imminent. Jackie said, "You came here to serve Jesus...you didn't know you'd be blown away by Jesus." You'll see in the pictures below their storm shelter. Imagine 10 people and 3 dogs taking refuge in that small space. Saving them from the tornado. Our projects yesterday included taking out and installing a window, putting up siding, clearing debris and digging holes for the new pole barn. Add a little fire to the mix and you've got a winning first day of work. Wildlife count: Horses, crawdad, king snake, frog, and a host of creepy crawlies. We have Rachael, biologist extraordinare, teaching us to love all of God's creation. Even if it has 8 legs.